The A' Engineering, Construction and Infrastructure Design Award is a design competition open to both concept stage and realized infrastructure and construction projects designed by professional and young architects, engineering & construction companies and contractors worldwide. This category does not accept real estate projects; since they have a seperate category. The A' Design Award for Engineering, Construction and Infrastructure is not just an award, it is the indicator of quality and perfection in design, the award is recognized worldwide and takes the attention of design oriented companies, professionals and interest groups. 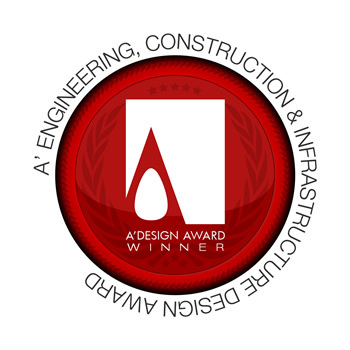 The winners of the A' Engineering, Construction and Infrastructure Design Award are provided extensive and exclusive marketing and communication services to promote the success of winning the A' Award. When submitting to the Engineering, Construction and Infrastructure Design Competition keep in mind that your submission will be evaluated on multiple dimensions, your real estate project design is judged together with its architecture, interiors, landscaping, and its communication. Applicants should send high-resolution images of the real estate project design, together with a presentation. Green and eco projects will be given additional credits to improve and support the quality of life worldwide. Each sub-category of the award will be evaluated independently, based on the specific criterias defined priorly. Architecture component, landscape component and interior design sections will be evalauted differently. The Aim of the Engineering, Construction and Infrastructure Award is to attract the attention of contraction media, magazines, and industry leads to your business by means of creating publicity and dissemination and also to separate you from the rest of the actors in the public sector by honoring your institution with a prestigious award. Award winners will be able to use a title that matches their nomination category: Such as "Construction Projects Design Award Winner". Optional Image #3 1800 x 1800 pixels JPEG Showing the project in the setting where the design is realized, or showing some further details from the architectural project, birdeye view etc. Documentation Max. 40 x A4 Pages PDF Explaining technical aspects, blue prints, details, commercial presentation or other notes about the architectural project, explosion, layered or sectional views if present. Video File Max. 10 MB. 45 Sec. AVI 3D Rotation / Exploration View, Conceptual Video, Short Feature or Advertisement of the infrastructure project.